Jin Cong busies himself inspecting the spring edamame planting. He needs to make sure that the green soy beans meet export quality standards when they are ready to be shipped in a few months. Jin is general manager of Jining Sunshine Agricultural Technology Co, a leading producer of frozen vegetables in Jining, East China's Shandong Province. "Green soybeans (edamame) mostly go with Japanese sake, which are quite popular in Japan's izakayas," Jin said. He expects the company's edamame exports to Japan to grow by one-third this year. 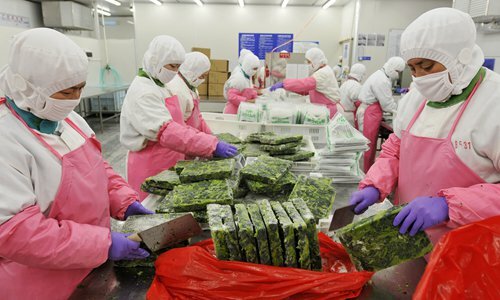 Founded in 2011, the company is among the top 10 frozen vegetable exporters in China. It exports about 4,500 kilograms of frozen green soybeans to the Kansai and Kanto regions of Japan annually. It also exports broccoli and shepherd's purse - a flowering plant in the mustard family. To better meet the demands of Japanese customers, Jin said his company had sent staff to the 44th International Food and Beverage Exhibition, held in Tokyo from February 5 to February 8. The firm owns more than 333 hectares of edamame fields in Jiaxiang county. The beans are planted in April and harvested in July. 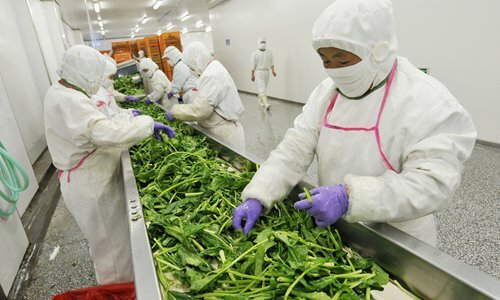 Zhang Deyan, vice general manager of the Qingdao-based Fusheng Foods Co, said the company had strengthened quality control in its 20 spinach planting bases by monitoring air, soil and water conditions. "We have set up three detection procedures to perform more than 260 tests, covering the whole process from growing, harvest to production," Zhang said. The company has invested 20 million yuan to build new testing labs. 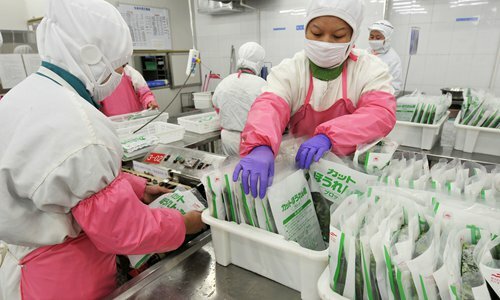 Figures released by Qingdao customs authorities show that 227,000 tons of frozen vegetables were exported to Japan from Shandong in 2018, up 7.9 percent year-on-year, accounting for more than one-fifth of Japan's annual import of 1.06 million tons. Apart from coastal areas, China's inland areas have also seen growth in export in frozen vegetables since an increasing number of vegetable producers paid more attention to the quality over the past few years. Workers at Ningxia Hongqiao Organic Food Co in Northwest China's Ningxia Hui Autonomous Region need to load at least two trucks of frozen vegetables every day. Edamame, green sword beans, broccoli and spinach produced by the company will appear in supermarkets or stores in Japan three to four days after departing Qingdao Port in Shandong, one of the largest ports in China. "The period between November and April is usually the export season for frozen vegetables. Our warehouse staff are very busy and work overtime every day," said Liang Sheng, vice-general manager of the company. Liang's company is the first frozen vegetable export enterprise in Ningxia. After meeting a series of international food safety standards, products have been exported to developed countries including Japan, South Korea, the US and France since 2017. Liang said around 8,000 tons of frozen vegetables were exported last year, half of which went to Japan, the largest export destination of his company. Starting from a traditional enterprise focusing on plantations, Liang attributed the company's success to innovation, product improvements and freezing technique upgrades. Once a small private firm, it has now become a large modern enterprise with a whole industry chain covering plantations, processing and sale.